LOS ANGELES -- Eva Monroy bought a mini pig for her family and fed it what the breeder instructed: a half-cup of food in the morning and a half-cup at night. But the piglet named Hammond started raiding the pantry and digging through the trash. A veterinarian told Monroy that he was behaving badly because he was starving. The breeder promised the diet would keep him a mere 12 inches tall. But when Hammond grew to 20 inches and 180 pounds, "my husband couldn't handle it any more. 'Either the pig goes or I go,'" Monroy, of El Monte, California, says he told her. So she took the animal to Lil' Orphan Hammies, a rescue about 130 miles northwest of Los Angeles. It's a common story playing out nationwide, leaving thousands of pet pigs homeless and rescues packed. The crunch has led many sanctuaries to limit how many pigs they will accept or stop taking them completely. The craze for tiny pet pigs started decades ago and gets reignited every few years. Online sellers offer teacup pigs for thousands of dollars, promising the animals will stop growing after age 1 and stay small if fed a restricted diet. But the tiny pigs keep growing until age 4 and will starve if they aren't fed properly with potbellied-pig food or a blend of vegetables, animal groups say. Once they grow too big to handle, people give them up. "There are not enough homes out there anymore. These pigs are in big trouble," said Sue Parkinson of Lil' Orphan Hammies in Solvang, which took in Monroy's porker and others no one else would. Parkinson, who has saved 1,000 pigs since founding the rescue 23 years ago, says she gets 20 calls a day from people trying to get rid of their pigs. Same goes for Nancy Koontz and her husband at Grazin' Pig Acres in Ramona, 40 miles northeast of San Diego. "We absolutely fell in love with the potbellied pig. But we can't take more because we don't have the time, money or help," she said. Anna Key, vice president of the North American Potbellied Pig Association, estimated that 90 percent of pigs adopted in the U.S. are later taken to a rescue or sanctuary. Complicating things is their care: Some veterinarians won't treat them because they consider them farm animals. Many cities and counties do not allow pigs on property not zoned for livestock, but that doesn't stop many pet owners. 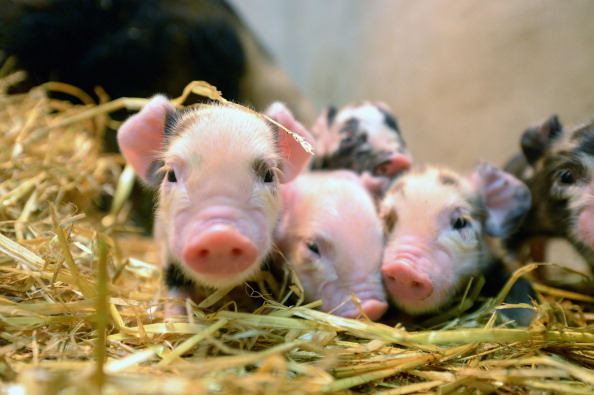 As pets, people get potbellied pigs, which are a fraction the size of commercial pigs. They typically weigh between 100 pounds and 120 pounds, while farm pigs bred for slaughter often weigh 1,000 to 1,200 pounds. Breeders say pet pigs can stay tiny because they're learning to eat less, but rescues say they're emaciated and losing muscle mass. "I have never seen a full-grown, healthy, 35-pound pig live to maturity," said Susan Magidson, owner of Ross Mill Farm in Jamison, Pennsylvania, north of Philadelphia. It's one of busiest rescues in the country, with 250 pigs and services such as grooming, massage and acupuncture. Breeder Patty Morrisroe of Dallas, Oregon, says her smallest pigs weigh 15 to 50 pounds for life by eating specially made feed. She says that her pigs stop growing after one year but that feeding them potbellied-pig food and letting them nibble on grass fattens them up. "Regular potbellied pig chow is not compatible with this extremely small breed," she said of the food recommended by animal-welfare groups. When pigs grow larger than expected, it can lead to heartrending decisions. Holly Jasma ordered a piglet costing $2,500 from a breeder who promised it would stay small. She had to give it to a rescue when it grew to 150 pounds. "It was gut-wrenching - pretty traumatic for me," the Seattle resident said.